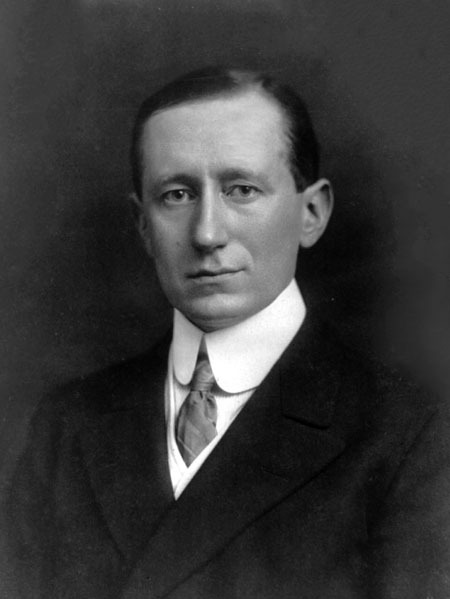 Marconi was born in Bologna, Italy, on April 25, 1874, to an Italian father and an Irish mother. His early education occurred mostly at home but was supplemented by schoolwork in Florence and Leghorn, and by his own practical experiments with electricity. In 1894 he learned of Heinrich Hertz’s 1888 discovery of radio waves. Inspired, he audited the classes of Augusto Righi, a radio­ wave expert, at the University of Bologna. Where the professor saw only an interesting scientific phenomenon, Marconi had a vision of mass communication—an ability to signal across long distances. In 1895 Marconi built a radio transmitter (an oscillator in which an electrical circuit produced radio waves) and receiver (a glass tube of metal filings, known as a coherer). Improving the apparatus, he added insulated wire antennae and grounded the transmitter and receiver. In fall 1895 his equipment sent and received radio signals across a distance of about two and a half kilometers. Marconi obtained an English patent for his invention in 1897 and formed the Wireless Telegraph and Signal Company (the name was changed to Marconi’s Wireless Telegraph Company in 1900). Continually engineering improvements, in 1899 he accomplished radio communication across a distance of 50 kilometers and soon more than doubled that range. In 1900 he was granted a patent for a system that enabled several radio stations to Operate simultaneously on different wavelengths. Convinced that radio could eventually connect people all around the globe, he set up a transmitter in England and a receiver in Newfoundland, Canada. A signal was successfully sent across this 2,800­kilometer distance on December 12, 1901, causing a worldwide sensation. Marconi thought that radio waves followed the Earth’s curvature, but it was later shown that they are reflected by the atmosphere and can thus travel great distances from point to point on the planets surface. Marconi continued to stretch the limit of radio signaling, improving transmission and reception, and establishing several long­ distance radio stations. His achievements won him the Nobel Prize for Physics in 1909. He served as a technical consultant to the Italian military during World War I and was instrumental in England’s 1918 radio transmission to Australia. The radio waves Marconi generated had wavelengths of about 8,000 meters; in the 1920s, he began investigating short­wave wireless transmission. Short waves are only a few meters in wavelength. Unlike longer­ range radio waves their range is limited if there are no relay stations along their path. Marconi found that short wavelengths produced louder signals, and he instituted a short­wave wireless system connecting England with its colonies around the globe. In his last years Marconi experimented with microwaves, those with wavelengths shorter than one centimeter. He died in Rome, Italy, on July 20, 1937. Marconi’s introduction of radio and shortwave devices created the foundation of modern wireless technology, which has a broad range of applications in radio, television, telephones, and remote controls. When first introduced Marconi’s radio system transmitted only simple impulses; it was a wireless telegraph using Morse code. In 1906 Canadian Reginald Aubrey Fessenden devised the modulation system that made radio a practical source of communication, a carrier of news, and a popular form of entertainment. Modulation translates speech and music into electrical impulses for transmission, and then demodulates them at the receiving end. The first widespread use of Marconi’s radio systems occurred aboard ships. Within a few years of the first wireless transatlantic communication, passenger and cargo ships traveling between Europe and North America used radio regularly to communicate with the shore and other ships. Such communication greatly improved navigation and enabled ships to steer clear of foul weather and collisions. The 1912 sinking of the Titanic fixed the significance of radio in the public view: radio communication to a nearby ship was crucial in saving the lives of many passengers. The first military use of radio took place during the Russo ­Japanese War, 1904 to 1905, and it was universally used aboard ships and airplanes during World Wars I and II. Regular radio broadcasts began in England in 1922 and in 1927 the British Broadcasting Corporation (BBC) was founded as a public company.